The Sony Xperia V arrives in a simple flat box with the standard peripherals: an A/C adapter, a microUSB cable and a headset with three earbud sizes and a lapel cilp. No NFC tags were to be found - these are consistently being omitted recently, which is a bit strange considering cheaper Sony smartphones used to have them bundled. It could be either that Sony don't see much point anymore in promoting a technology that should be well familiar by now, or the tags are market-specific accessories. The Xperia V measures a reasonable 129 x 65 x 10.7 mm and weighs 120 g. The handset definitely looks heavier than that and we were quite surprised by its lightness the first time we handled it. Nothing wrong, mind you - the Xperia V has a very pleasant feel in hand. The Xperia T, in comparison, weighs a good 20g more but we wouldn't say the V lacks substance. What we didn't quite like about the Xperia V, and it shouldn't be a surprise to anyone who has handled the Xperia T, is the excessive bezel top and bottom of the screen. With on-screen controls requiring no extra space, it seems this could've easily been a smaller package. The Xperia V is nearly the same size as the 4.7-inch HTC One X, but with a 4.3" of screen diagonal. To be fair though, the Xperia V is IP57-certified for dust and water-resistance, so the overall superior durability may be a fair trade to many. The Sony Ericsson legacy is still firmly felt across the new Xperia line of smartphones - in this case the Xperia Arc takes the credit. Of course, the Xperia V is a minor redesign of the Xperia T, and once again we're impressed with the subtlety of the curved shape and the overall finish. The Xperia V is all plastic but has no glossy parts whatsoever. The most prominent difference - which we think is well in favor of the V - is the dark chrome frame that separates the back and front. The handset's back feels rubbery to the touch and is quite nice to hold. Above the 4.3" Reality display there's an earpiece, a VGA camera, ambient light and proximity sensors and a notification LED. The VGA front-facer on the Xperia V isn't quite up to par with the 13 MP around back - that's one of the things getting downgraded from the Xperia T. The Bond phone had a 1.3MP front cam. Under the display there's nothing but blank space. Sony is done with physical buttons and not looking back. The Home, Back and Task switcher keys are right onto the touchscreen panel. The power button and volume rocker are placed near the top on the right side of the Xperia V. Both buttons are slim but prominent enough and solid to press. This is the perfect placement for right-handed users, but lefties may find it hard to reach the controls with an index finger. The bottom of the Xperia V features only the primary microphone. There's a tiny slit on the back panel to place a fingernail and pull it open. The covered microUSB port is on the left side. Further down on the same side are the dock pogo pins. The 3.5 mm headphone jack is at the top, sealed with a plastic lid again, to ensure the water resistance. The back panel is entirely made of plastic but with a rubbery finish, which not only is a pleasure to hold but has anti-slip properties too. The 13 MP camera lens is located in the top with the secondary, noise-reducing microphone next to it. A single LED flash is below the lens and, a little further down, an Xperia logo. Centrally-placed at the very bottom is the loudspeaker grille, which is small and designed as to not let water in. It still sounds decent though, unlike on the acro S.
A tiny pinhole above the loudspeaker grille, matched by a membrane on the inside of the battery cover, is a water sensor which however is of no value to the user. It will only let the people at a Sony service center know if the limits of safe operation have been exceeded. 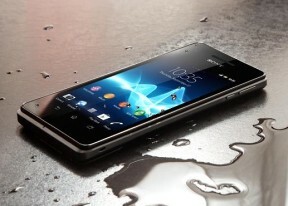 There are no water resistance warnings on the Xperia V - unlike the Xperia Active, which would warn you when the flaps of the connectivity ports have been undone. Removing the panel is perhaps too easy for an IP57 certified device (though we have no reason to question the water-resistance claims) and doing so reveals an insulating trim of rubber on its inside, to protect the innards from getting wet in an event of water making its way inside. The 1750 mAh Li-Ion battery is said to offer 300 or 400 hours of stand-by (2G/3G), 7 hours of talk time on either network and 18 hours of music playback (in airplane mode). Our real life tests show an endurance rating of 30 hours, meaning an hour of calling, browsing and video will result in the phone being charged every 30 hours. 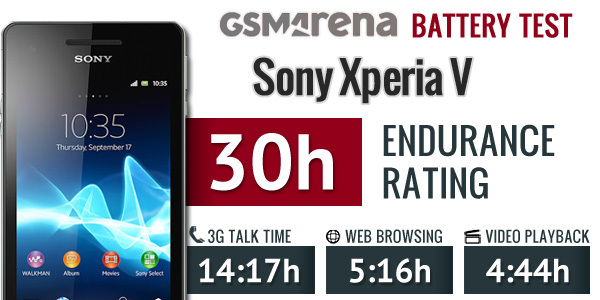 Some users have reported the so called Sleep of Death issue with the Xperia V. When the phone stands idle for a couple of hours (mainly during the night) it freezes itself and can then be powered on only after removing the battery. We experienced the issue a couple of times too, but after updating the phone to the latest firmware (9.0.1.D.0.10) the issue seemed to be resolved. However some users are reporting than the update hasn't done the trick for them and the bug is still present even after the latest update. Others report the Xperia V heats up prior to freezing and loses battery fast, but we didn't observe such a phenomenon. Sony has already acknowledged the issue and has promised it is working on a fix. However there's no info when exactly we might expect that. The SIM card and microSD slots are placed one above the other and the battery needs to be removed to access either of them. Now, a water-resistant phone is one of those rare occasions where a non-hot-swappable memory card slot actually makes sense.